Even though this blog is mainly about gardening, one reason why I grow my own food and cook at home is so my daughter has first hand knowledge about where her food comes from. My daughter already loves going into the garden. She particularly loves the chive flowers and picking strawberries. Inside the house I have been working on a play area for her which allows for her to play out some of our everyday adventures in the garden and kitchen. 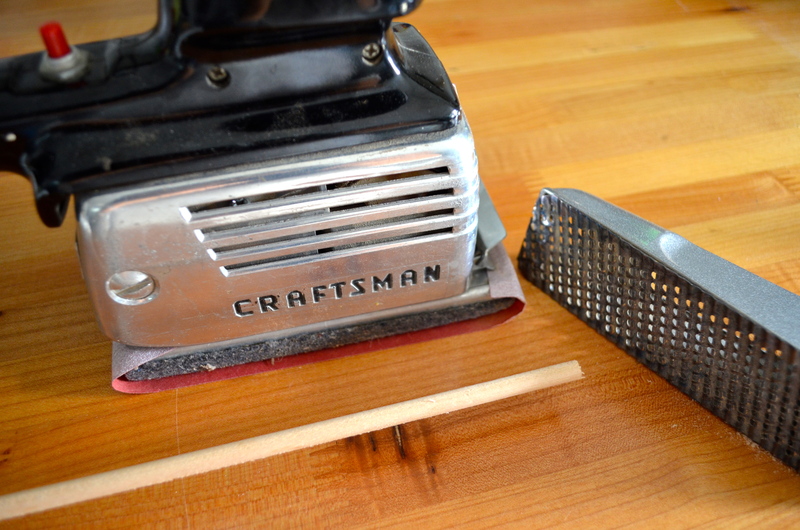 So bare with me… this post is slightly indirectly about gardening. This is mainly going to be about kitchen play. 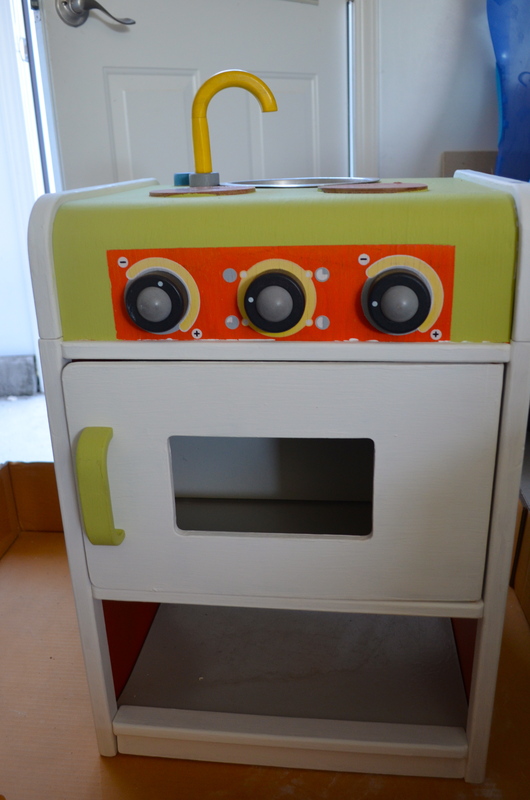 A few months ago I was lucky enough to score this Plan Toys play kitchen off of freecycle. Yup, that’s right folks… I got this thing completely for free. It definitely was dirty and even came with a few spiders. The wood was a little warped in some places from being left outside on a porch. The lady that gave it to me said her sons got a few good years of playing with it but she just didn’t have the energy to redo it. I first cleaned it up a bit just with some wet wipes. 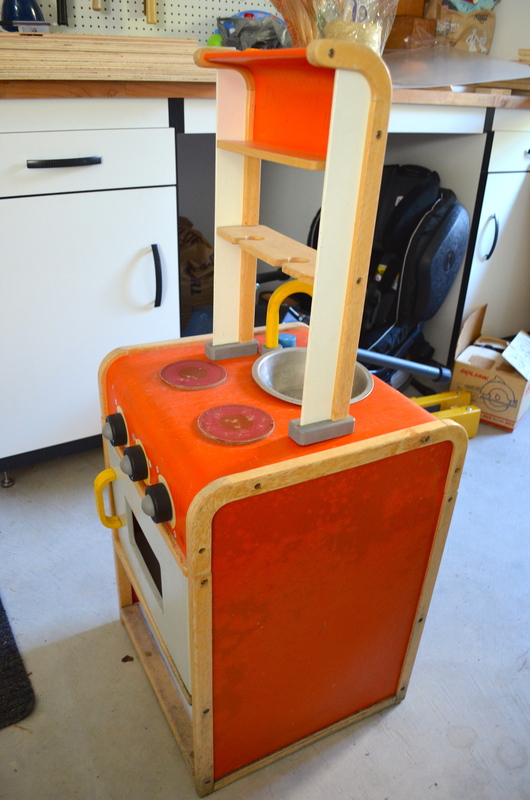 I took apart the entire thing and I sanded down some of the wood. 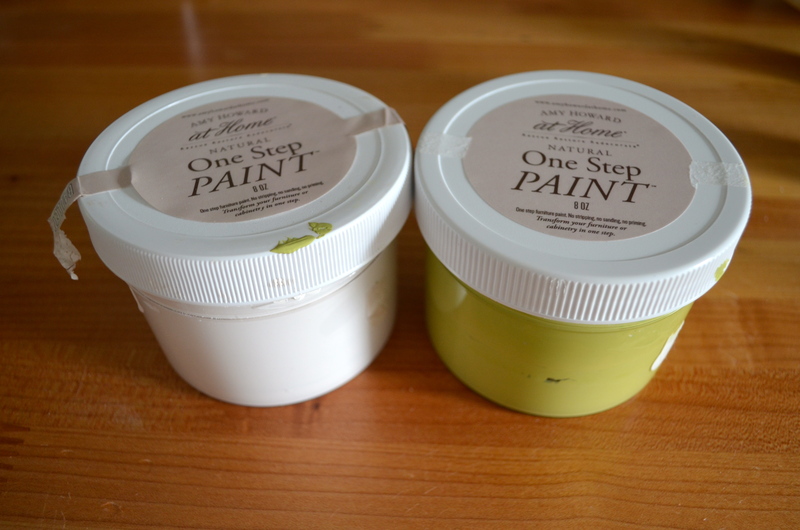 I used Amy Howard’s Chalk Paint to give it a new face lift. 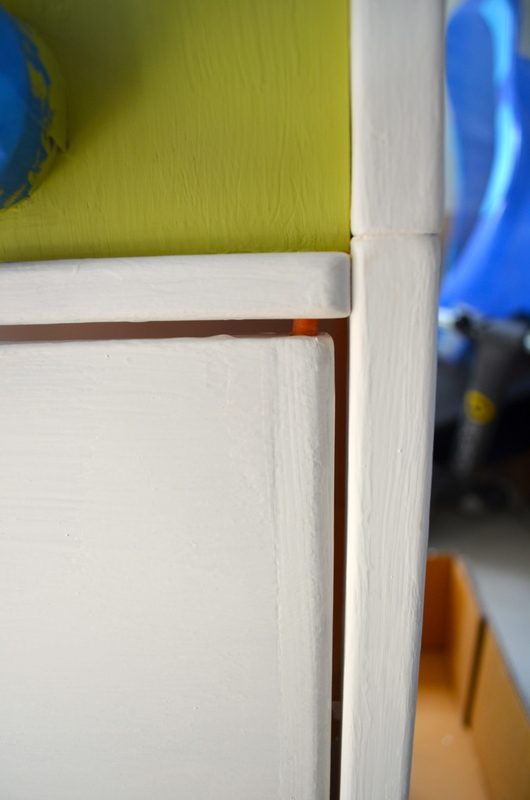 I used Ballet White for the trim and doors and Lime Lime for the face. At first I tried to paint around the dials to keep the detail work but in the end I didn’t like how the orange clashed with the green. Also I wanted a streamlined look. I did several coats of each color to get a good finish. I also did some touch up paint in some areas since it got a bit dinged up being in the high foot traffic area of the garage. The top part of the kitchen had a shelf and a rack but some screws were missing and I decided to go without the shelf since I liked the look better. 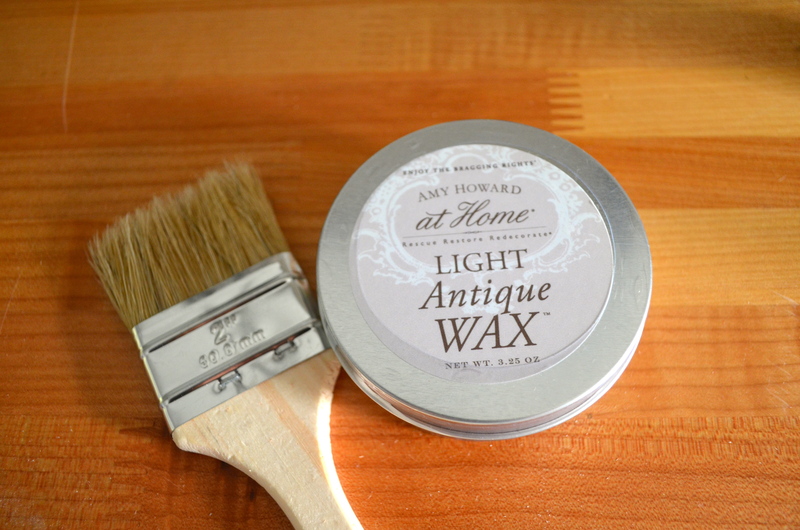 After the few coats of paint I used Amy Howard’s Antique Wax to finish the piece. The wax will help protect the paint and will hopefully be a bit water resistant as well. I just lightly painted the wax on with a brush, let it dry for about 30 minutes and then buffed it with a clean old cotton t-shirt. I also had to fix the doors. There is an oven on one side and a refrigerator on the other. The kitchen came with only two plastic dowels to hold the door in place which meant that one door wasn’t attached at all. My solution was a 45 cent one. I got a 1/4 inch dowel from the hardware store, cut it to match the length of the plastic one. However, the width of the dowel was too big so I spent time striping the dowel down with a rasp (carefully as to not rasp my fingers) and then sanding it until it fit. The inside shelving of the kitchen was water damaged, warped and overall pretty gross. I decided I didn’t want to paint it so I opted for removable wall paper. I wanted something that would pop from the inside but nothing too crazy. I ended up ordering this Tribal Chevron wall paper. It was a bit pricey but I justified the cost because I got the kitchen for free. Did I mention that it was free? 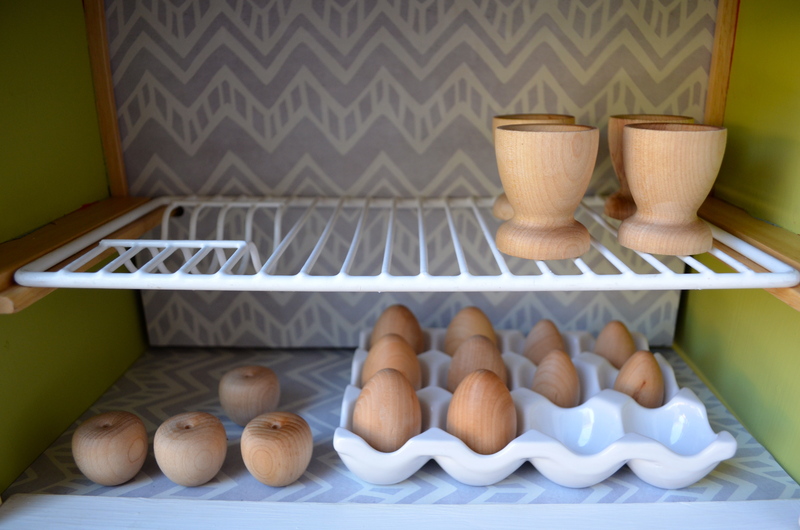 Over the past several months I have been collecting some kitchen items for my daughter to use while I worked on the kitchen itself. 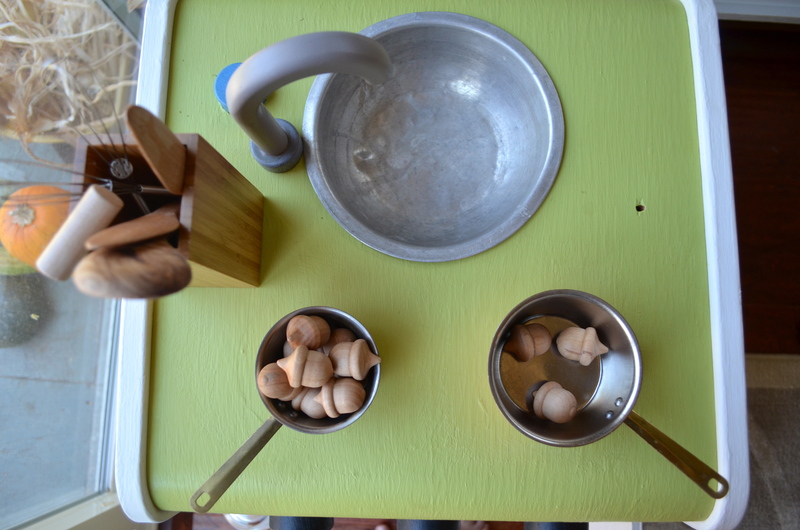 We went to thrift shops and found some wooden bowls, and awesome measuring cups that she can pretend are saucepans. We also went “shopping” in our own home and found a teak container to hold cooking utensils and a jar full of wine corks. 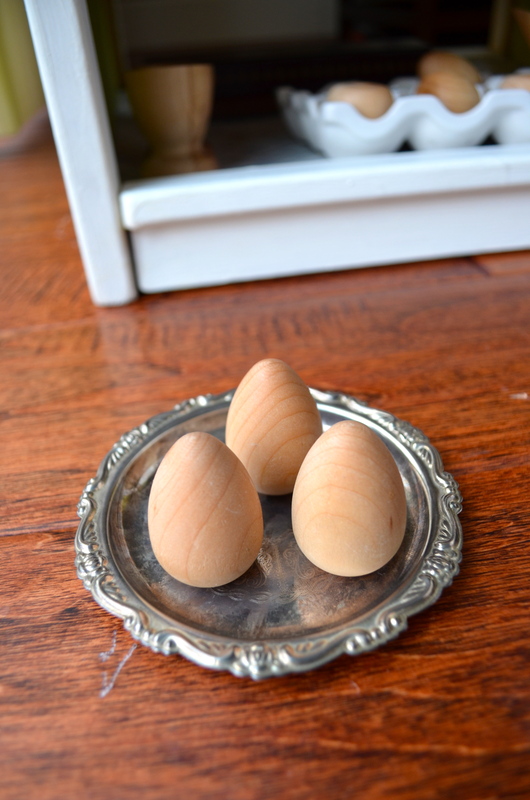 I found a sweet Etsy shop called Gems from Before where I bought some wooden bowls, plates, egg holders, wooden acorns, crab apples and eggs. 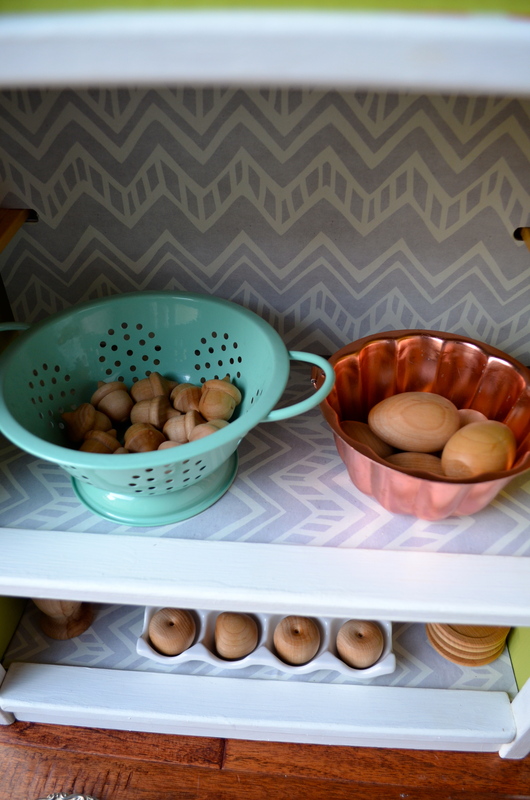 Before I introduced the play kitchen, my daughter used a wine crate as her cooking surface and spent a lot of time transferring the acorns from one bowl to another with the wooden spoon. The only thing left to do is to replace the burners so I have been on the look out for coasters or trivets that would work in the space. Over the next several months we will continue to transform the space around the kitchen. I am thinking of putting in a mirror and hooks along the wall to add some aprons and dress up materials. 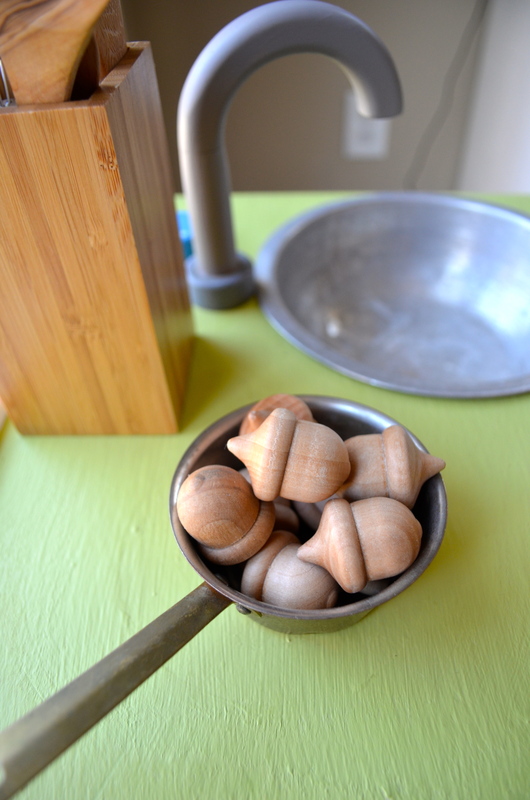 Also I will be on the look out for some more natural materials to add to the space like buckeyes for her pretend cooking. Overall I love how this project turned out and I am glad a simple piece of furniture will get many more years of play! Tags: Amy Howard's chalk paint, children's activity, children's pretend play, natural materials, play kitchen, removable wall paper, upcycled play kitchen, wooden toys | Permalink. Oh my. I seriously cannot love this more than I do. I just love everything about this post – Let me see. 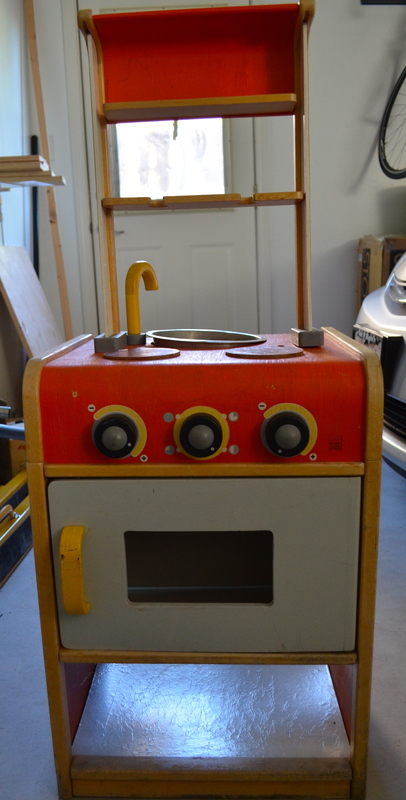 FREE adorable and vintage wooden kitchen! how you brought it back to life and made it a project and documented it – beautiful photos by the way. 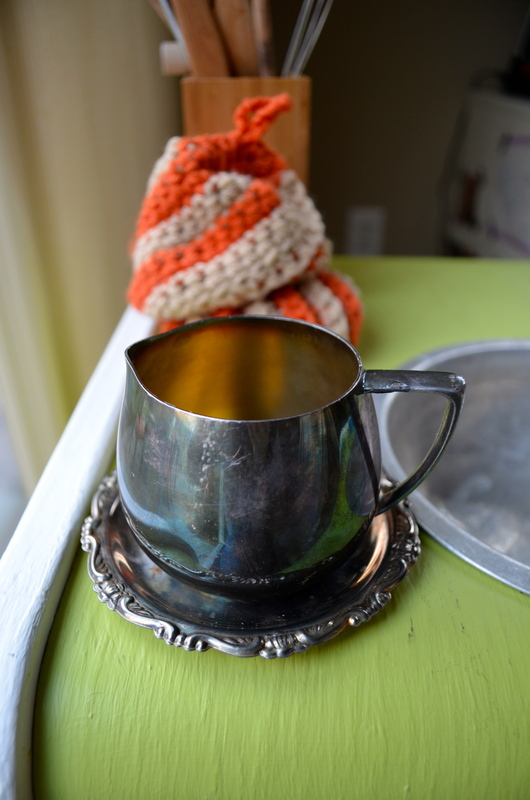 the use of items from your kitchen and vintage real life pieces from the thrift store. Then of course all the sweet pics of my wooden pieces. I just love it. Bravo Mama! Thanks Jodi. 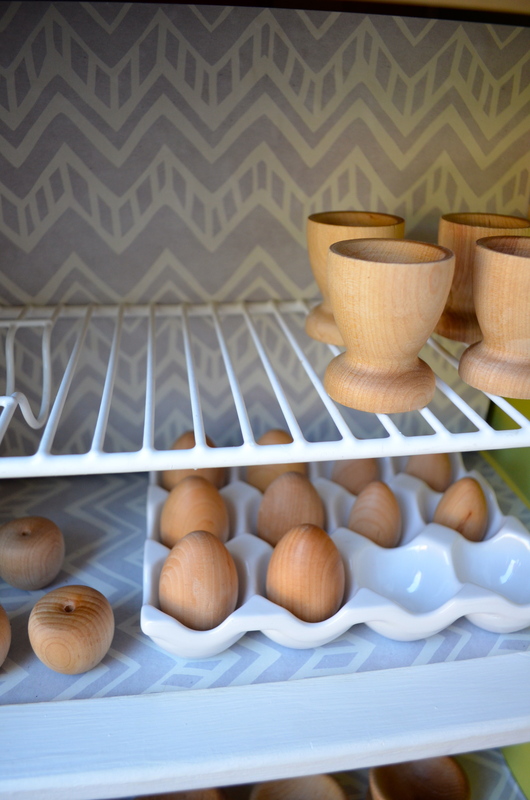 I think your wooden pieces are really the highlight of the whole space! They are beautifully made and my daughter loves playing with them every day. I’m so glad I found your etsy shop! It’s so amazing! I can’t wait to see it in person. You have one lucky little girl! And Jodi! 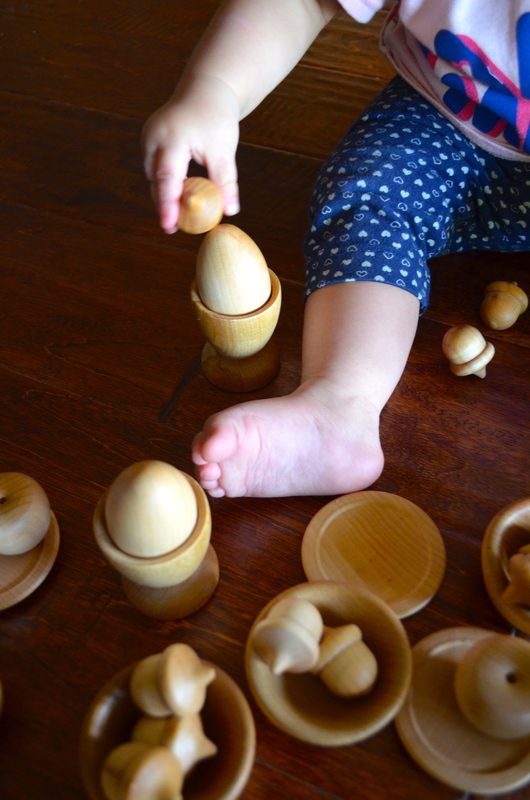 This amazing friend of mine ^^^ gave my 3 year old a set of your sweet wooden toys for his birthday. They are great! What a wonderful product.